"This is my grandma's famous recipe, except that I use sour cream instead of the traditional cheeses (a trick I picked up from my mother-in-law). She always made it for birthday dinners and special occasions. This makes a large amount. I halve it when making it for my boyfriend and myself. It's very cheesy - sometimes I add a little extra tomato sauce. Enjoy!" Heat a large skillet over medium-high heat and cook and stir the sausage, ground beef, and garlic until the meat is crumbly, evenly browned, and no longer pink. Drain any excess grease. Stir in the diced tomatoes, tomato sauce, parsley, basil, oregano, and sugar. Bring to a boil over high heat, then reduce the heat to medium-low, and simmer, stirring occasionally, until the sauce is thickened, about 30 minutes. Stir together the sour cream, eggs, Parmesan cheese, green olives, salt, black pepper, and 1/2 of the mozzarella cheese in a bowl. To assemble the lasagna, spread a thin layer of the meat sauce evenly over the bottom of a 9x13 inch baking pan. Cover with 1/3 of the lasagna noodles, 1/3 of the remaining meat sauce, 1/3 of the sour cream mixture. Repeat this layering 2 more times. Sprinkle the remaining mozzarella cheese evenly over the lasagna. Bake in the preheated oven until the sauce is bubbly and the top is golden brown, about 30 minutes. 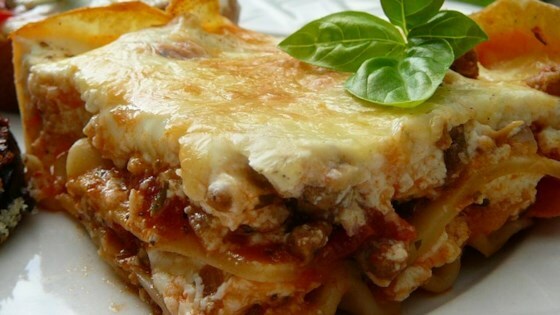 See how to make the best homemade lasagna! Not really what you would expect from lasagna, but amazing. I made it tonight and was very pleased. Very good! My husband does not like Ricotta Cheese, so this was perfect. I plan to omit the salt next time; it was not needed. I also used no-boil noodles and it came out perfectly.